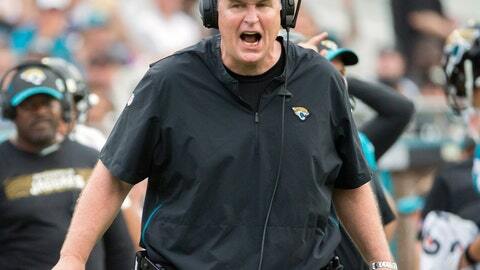 JACKSONVILLE, Fla. (AP) — All those yellow flags thrown against the Jacksonville Jaguars have coach Doug Marrone seeing red. The Jaguars (3-8) have been penalized 80 times, tying them for seventh in the NFL, and have been docked the fourth-most yards (751). But Marrone’s main concern is that Jacksonville has been called for a league-leading 22 personal fouls, none more costly than running back Leonard Fournette’s unsportsmanlike conduct penalty last week at Buffalo. Marrone is clearly frustrated with his team’s undisciplined ways. “It has been addressed and obviously further steps have to be taken for us,” Marrone said. Fournette was tossed late in the third quarter Sunday and suspended one game without pay a day later for leaving the sideline, running across the field and instigating a fight with Bills defensive end Shaq Lawson. Fournette and Lawson exchanged punches before being separated. Without the team’s best offensive player, Jacksonville failed to score from inside the Buffalo 1-yard line on first down and then got called for consecutive penalties that left the offense facing second-and-goal from the 17. The Jags failed to do much from there and then missed a 42-yard field goal that would have put them ahead 17-14. Adding to Marrone’s angst, defensive end Yannick Ngakoue (face mask) and safety Barry Church (unnecessary roughness) were flagged on Buffalo’s next two plays — both 15-yarders that set up the Bills’ go-ahead touchdown. “The way the team plays is a reflection on me,” Marrone said. “I understand that. I always have. I’ve always taken a lot of pride in having a well-disciplined, smart football team and obviously I’m not getting that done. The Jaguars have little room for error because of offensive struggles related to poor quarterback play, average receivers and mounting injuries. Penalties only make it more difficult for them to move the chains and score. Tom Coughlin, the team’s executive vice president of football operations and Marrone’s boss, also called out players for their conduct. Jacksonville, which has lost seven consecutive games, hosts Indianapolis (6-5) on Sunday. The Colts have won five in a row, including a 29-26 victory against the Jags three weeks ago. Marrone fired offensive coordinator Nathanial Hackett and benched quarterback Blake Bortles on Monday. He also made it clear more changes could be on the horizon if the team doesn’t end its losing streak — and cut down on the personal fouls. “It’s basically just going to be an end result; you either get it done or you don’t get it done,” Marrone said. “If it’s not good enough for the people you work for, then hey, they’re going to let you go. We all know that. It’s nothing to hold your head down about or nothing to feel bad about. It’s like anything else. I walk in around here, it’s embarrassing, it’s frustrating.